An excellent overview of the history of the Town of Gaines may be found in “Historic Gaines, 1809-1984” by Delia Robinson. Featuring numerous photographs, each community in the town has its own chapter, highlighting major events and significant people. It was originally published for the 175th anniversary of the town, and may be borrowed from the Nioga Library System. 1875 School Districts Map, Courtesy of the Cobblestone Society. 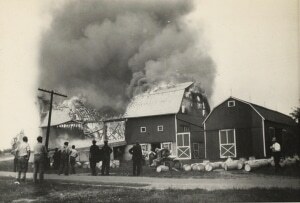 A photo of Densmore’s first barn fire, around 1929.
his memories of Bill Densmore and the ’44 fire. According to the Orleans Republican, the total loss of the 1944 fire was estimated to be about $15,000, the equivalent of $214,000 in 2019. He lost a truck and its load of peaches, which must have been particularly discouraging. It had been a bad year for peaches, and Densmore was one of the few farmers in the area who had much of a crop. The newspaper stated that he also lost “several hundred bushels of wheat, which was to be sown soon.” John Long clarifies this report, explaining that Densmore would have intended to sell most of it, keeping only a little for himself. A great deal of hay also went up in flames. Unlike the first fire, there were no animals to worry about. At this point in time, Densmore had all his livestock at another farm on Transit Road. Rebuilding in 1944 was perhaps more challenging than before because World War II made resources scarce. Farmers in his situation couldn’t always find enough new lumber, and sometimes had to look for used beams. Having a truck was crucial, because that was how farmers got their produce to the processors, and money in their pockets. 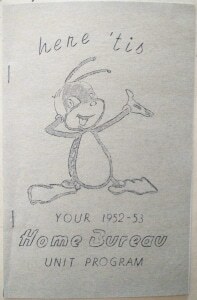 Although production of consumer vehicles had stopped because of the war, Densmore applied to the county War Rationing Board and became the owner of the newest truck around. Mr. Long remembers it as a green GMC with a black painted grill, probably made for the military. Bill Densmore’s third barn has fared better than the previous two. It’s a handsome white building that can still be seen on the east side of the road, sitting on the same foundation as the original. It stands as a quiet testament to one man’s perseverance and love of farming. This photo shows a view of Rt. 279 as seen from Ridge Road looking south. Judging from the leaves on the ground, it seems to have been taken about this time of year. The main road intersected the Ridge as it does now, but the photo shows a lesser-worn path leading east to the Ridge. The flowerbed in the resulting triangle looks as though it had experienced some colder temperatures. The image reveals a period of transition; Gaines was not yet completely “modernized.” In order to travel directly from the hamlet of Gaines to Albion, one would have driven down a dirt road, with transmission lines from the hydroelectric plant in Waterport on the left and telephone lines on the right. Homes on this road had access to electricity in the 1890’s, long before the rest of Gaines. Ridge Road was paved with cement in the mid-1920’s, and the curb at the base of the flower bed suggests the snapshot was taken after that development. Dean Sprague, longtime Town Clerk for Gaines, and his wife Ethel, who lived in the house on the southeast corner of the intersection, maintained the flowerbed before the State eliminated the lesser used turn-off. These photographs of Teddy Roosevelt were discovered in the course of filing materials in the historian’s office at Gaines Town Hall. No information is recorded on the backs of them. Accompanying notes indicate they were donated by Dan Hatch. 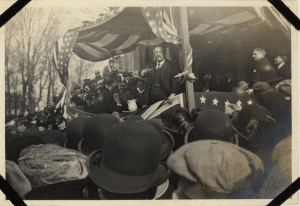 Although Theodore Roosevelt never spoke in our township, folks from Gaines made sure to see him speak in Albion, which he did on three separate occasions. He spoke there on Oct. 26, 1898, Oct. 31, 1900, and Nov. 1, 1910. The question is, on which occasion were these photos taken? This is where history starts to look like detective work. 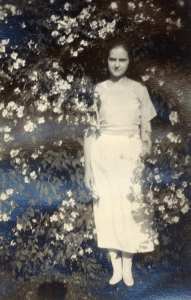 These snapshots were most likely taken with a Kodak Brownie camera. The Brownie was the first mass marketed camera for the general public, and was introduced in February 1900. Therefore, these photos were not taken of Roosevelt as candidate for New York State governor in 1898. Any photographs of that speech would have been taken by a professional photographer. These photos are either of Roosevelt as governor, or as former president. The photographs produced by the first Brownie camera were about 2″x2″. In 1901, the No. 2 Brownie was released, which produced snapshots about 2″x3″. 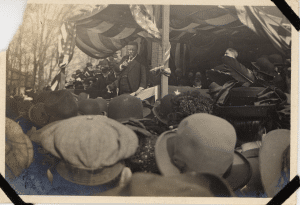 Since the above photos are elongated and not square, they were probably taken during Roosevelt’s 1910 visit. 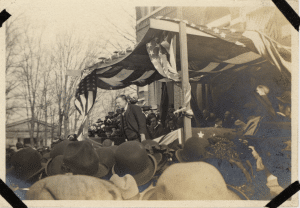 Roosevelt spoke from a platform constructed in front of the County Clerk’s Office. The top photo shows more of this building than the others. It also clearly shows the gable of what is now the Presbyterian church’s dining room in the background. All of the photos show people gathered on the northern steps of the Clerk’s Office. Since the bottom third of these images show a sea of hats, it seems the photographer must have held his camera over his head to take pictures, hoping he would get some good shots. It also appears he jockeyed himself among the crowd in order to get closer, as can be gaged by the proximity to the platform and changing position of the hats in the foreground. It is also interesting to note the presence of feathered hats — even though women could not vote, they were there as well. 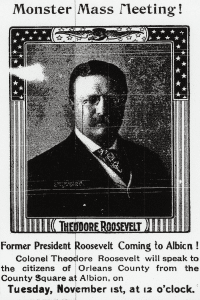 Subscribers to the Orleans American learned of Roosevelt’s visit the week before with the following front page ad. 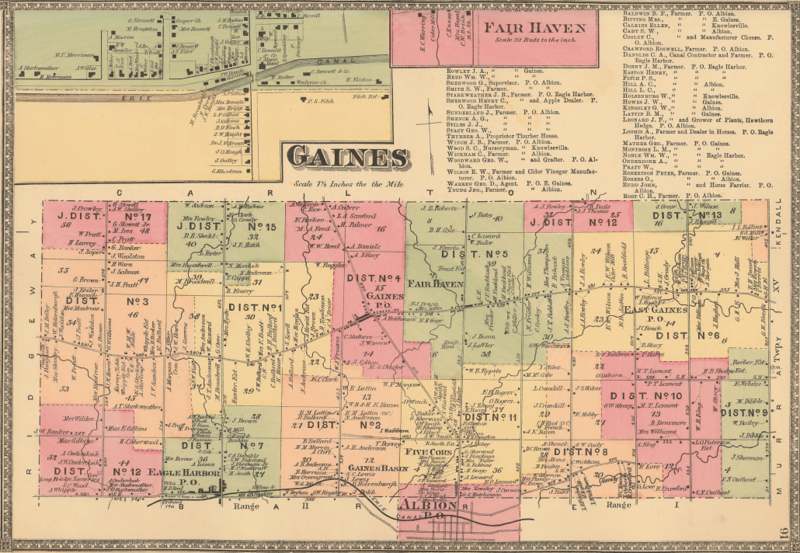 Gaines had six Home Bureau units in 1953: West Gaines, Gaines, Childs, East Gaines, Eagle Harbor and Gaines Basin. The Eagle Harbor unit had eighteen members. Meetings and activities took place either at members’ homes, or at the Methodist church by the canal. 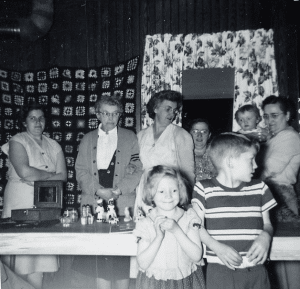 Below is a photo of a Home Bureau hobby show held March 25, 1954 in the Methodist church dining room. It was noted that all families participated. Back row from L to R: Mary Hults, May Brooks, Mildred Buck, Hilda Fancher, Barbara Eddy (baby), Jean Sullivan. Front row L to R: Dorothy Hults, Duane Hults. Beat together the eggs and sugar; add the flour, salt and baking powder. Stir in the apples, pecans and vanilla. Pour into a buttered baking dish or into 6 custard cups and bake at 350°F about 30 minutes. Serve warm or cold. Happy Independence Day from Gaines! The above photograph of an unidentified boy, most likely taken in Gaines, comes from a small photo album that belonged to Virginia Lattin Morrison. Below is a photo of Virginia found in that same album. She was a longtime resident of Gaines. Coincidentally, today was Virginia’s birthday. She was born July 4, 1906. In 1919, she turned 13. To celebrate her birthday that year, Virginia could have gone to the recently opened ice cream parlor above Mr. Spaulding’s grocery in the rebuilt White’s Hall. White’s Hall, located on the southwest corner of 104 and 279, was a social hub. Prior to a devastating fire in 1910, it housed a grocery store, post office, grange hall and was Town Meeting headquarters, among other social activities. She would have been too young to attend the box party that evening with the Swarts Orchestra at the Grange Hall, which had moved across the street to what used to be Thurber’s Hotel in 1915. Admission was $1.00, plus 10 cents war tax. A box party was essentially a dating game. Women would make a meal for two and put it in a cardboard box they had decorated. Then men would bid on boxes, not knowing what was inside or who the creator was with whom they would share the meal. Dances and social events like this were common fund raisers for the Grange. https://www.townofgaines.org/wp-content/uploads/2018/03/logo.png 0 0 histedit https://www.townofgaines.org/wp-content/uploads/2018/03/logo.png histedit2018-07-04 01:00:412018-07-21 12:38:44Happy Independence Day from Gaines! Note: I am deeply grateful to Dee Robinson for her overall encouragement, her suggestion of this topic, and for her assistance in researching it. The New York State Fair, held Oct. 1-4, 1867 in Buffalo, was a disappointment in some ways. “The grounds, unfortunately, presented a rough surface—appearing as if tread up by cattle in wet weather, and left to dry and harden in that condition. The buildings were poor, unattractive, and, in some instances, of not sufficient capacity for the use for which intended….The victualing department did not present its usual attractions.”1 But for John A. Lafler of Gaines, it was a source of celebration. Along with at least two competitors, he demonstrated how his brick machine worked for the crowds at the fair, producing “crude” or unfired bricks. The New York State Fair report for 1868 noted Lafler “showed his iron clad brick machine, to which was awarded the first premium at the late fair in Buffalo, for making best quality of brick. We believe it still maintains its superiority.” Lafler not only brought his machine to the New York State Fair multiple times, but he also displayed it at the Centennial Exposition in 1876, an international event which covered over 285 acres in Philadelphia. The only information we have about John Lafler comes from census records, his patent, a handful of passing references, and church records. Lafler first appears in Gaines on the 1855 census, but was most likely here in 1852, since his three year old son was noted as being born in Orleans County. Lafler was a native of Ontario County. 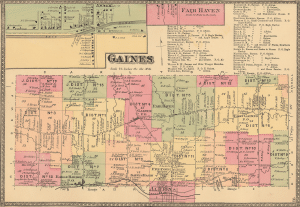 When he decided to settle here in the 1850’s, Gaines had a larger population than Albion and at that point might have appeared to be a more vibrant community than our neighbor to the south. 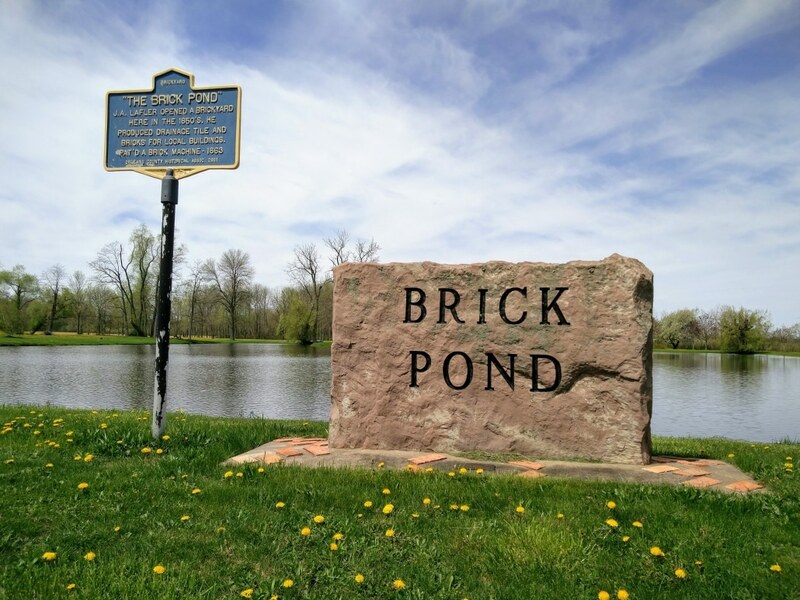 He and his family lived across the road from his brickyard which is now the Brick Pond on Rt. 98, a half mile south of Rt. 104. From the information we do have, we can surmise he was a successful businessman. By the time he applied for the patent for his machine in 1863 at the age of 48, he had been in Gaines for at least ten years. He enlisted the support of John N. Proctor and Isaac Gere, both from prominent area families, to sign as witnesses to his application. His brickyard was in operation from the early 1850’s to the early 1890’s. His son Charles continued to run it for over ten years after his death in 1883. As a member of the Congregational Church in Gaines, he paid for the transom window above the double doors of the old church. Lafler’s brickmaking machine was essentially a barrel with a vertical shaft inside that had tilted blades protruding out of it. As noted in the patent, this shaft was “rotated by any convenient power,” most likely horses or steam. The clay would be placed in the barrel from the top, and the rotating blades would simultaneously knead the clay, push it down into the molds, as well as scrape excess clay off the top of the molds. A spring-loaded “clod-crusher” would compress the clay in the molds from below. 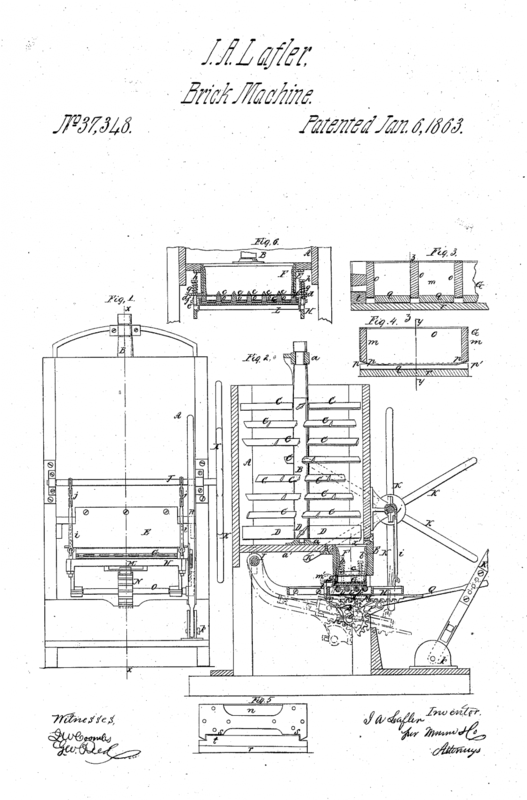 It is unclear from Lafler’s patent exactly how many bricks could simultaneously be pressed by his machine. However, one of his competitors paid for a full-page advertisement in the 1866 edition of the New York State Agricultural Society’s Abstract. It claimed that the machine “will make from 2,000 to 3,000 brick per hour, with seven or eight hands and a pair of horses.” A look at the 1875 census suggests Lafler’s machine might have required a similar amount of manpower. 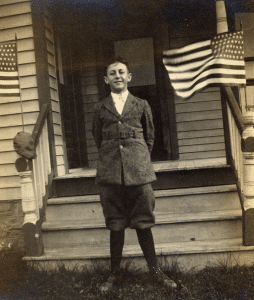 In that year, twelve men were listed as laborers in his household, half of whom were immigrants from Germany, Ireland, Sweden, Belgium and England. It’s reasonable to suppose that if eight men were kept busy running the machine, another four might be needed to dig the clay to feed it. If Lafler’s machine had a comparable output to his competitor’s, then the amount of bricks needed to build a small brick house about the size of the one next to the Cobblestone Church in Childs could be pressed in three hours or so. Lafler’s brickyard was not the first in Gaines. 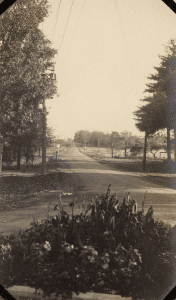 William J. Babbit established the first brickyard around 1820, on the southwest corner of the intersection of Ridge Road and Crandall Road. It is also believed there was an early brickyard on the southeast corner of the intersection at Ridge Road and Rt. 279. Before the advent of machines like Lafler’s, brickmaking in the early 19th century was a handmade, straight forward affair. Clay was pressed into a single brick mold, and then a tool was used to scrape off the excess clay. The mold was then tipped over onto a small pallet, and hopefully, the brick would come out of the mold intact. If some clay remained inside the mold, the brick would have to be repressed – the mold placed over the brick once more, tamped, and tipped out again. Perhaps this is the problem Lafler claimed his invention overcame in the ads he placed in a few 1869 issues of Scientific American. Another improvement of machines like Lafler’s over the ages-old method of hand pressing bricks is that they would produce more uniform, more compact, harder bricks. Prior to factories, there was no way each handmade mold would each be exactly the same. Repressing would also create variation in bricks. Using a team of horses or steam power, it is easy to understand how Lafler’s spring-loaded machine would be able to exert more pressure on the clay than even the burliest of brickmakers. It is probable that we see Lafler’s product in many local brick houses, but we don’t have documentation. 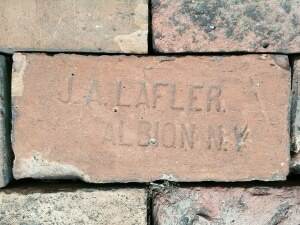 There is strong reason to believe that the First Baptist Church in Albion was constructed with Lafler’s bricks in 1858. What is now the rectory for Holy Family Parish may have also been built with his bricks as well. There is proof beyond a doubt that his bricks were used in the platform in front of the Cobblestone Church in Childs, for several have his name stamped into them.